Jack Welch, the former legendary CEO of GE, "viewed this as anathema. He believed in creating an open collaborative workplace where everyone's opinion was welcome." He wrote in a letter to shareholders: "If you want to get the benefit of everything employees have, you've got to free them – make everybody a participant. Everybody has to know everything, so they can make the right decisions by themselves." By making all his employees feel that they had a stake in the company’s future, Welch was injecting a spirit of common purpose among GE’s employees and businesses. Case in Point "Great Game of Business"
We want to live up to our end of the employment bargain. We want employees to seek new challenges by thinking about where they want to go in their work and their lives, instead of getting trapped in the same old routines. 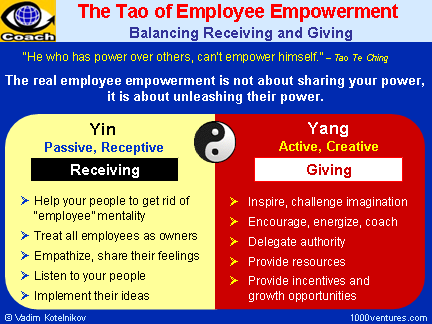 We want get rid of the "employee" mentality. Each person thinks and acts like an owner. We want to create and distribute wealth. Productivity improves as employees work to create an organization based on continuous improvement and on helping one another.